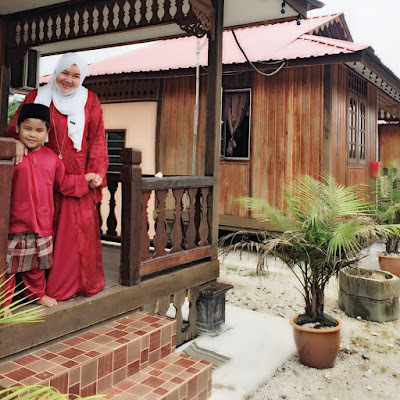 Tariq's first school holiday activity is one of Malaysian's best cultures - attending our many wedding invites! This is in Batu Pahat. And Tariq was super excited to be in this Homestay. He kept jumping up and down as he loves to hear the cracking sounds the wooden house make! This architecture is a typical Johor traditional house, with the tropically-suited roofs and harmonious proportions with decorative elements. The traditional Malay house require stairs to reach the elevated interior. Usually the stairs connected the land front of the house to the serambi (porch or verandah). Additional stairs might be found on back of the house. The stairs can be made of wood or brick structure covered with tiles.